1877 was pretty good for the Braves (then known as the Boston Red Caps). They were 42-18 and ended in first. Arthur H. Soden is not a household name these days. He became one in 1877. He headed a group of three men who bought the Braves. The two other partners were William Conant and James Billings. Soden served as President of the club a long time, 30 years to be correct. He and the other two became known as the Triumvirs. If you know ancient history, that would be Caesar, Pompey and Crassus. Some things last a long time. One of them was what was known as the “reserve clause” in baseball. It lasted almost 100 years. Soden is the man who wrote it into the leagues by-laws. It bound a player to his club no matter what. There was no such thing as “free agency” then. Even if another team wanted to pay them more, they couldn’t go unless their current team traded them. Of course, the “Four Seceders” had a little to do with that. The reserve clause wasn’t in place yet that year when manager Harry Wright decided that Tommy Bond should replace his pitcher Joseph Borden and the Joseph should be a groundskeeper. 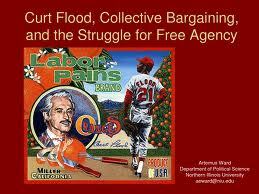 In October 1969, St. Louis Cardinals outfielder Curt Flood challenged his trade to the Philadelphia Phillies. Flood sacrificed the remainder of his playing career to pursue this litigation. Flood’s case established that the reserve clause was a legitimate basis for negotiation in collective bargaining between players and owners, and that the historic baseball antitrust exemption was valid for baseball only and not applicable to any other sport. Removing the reserve clause from player contracts became the primary goal of negotiations between the Major League Baseball Players Association and the owners. The reserve clause was struck down in 1975 when arbitrator Peter Seitz ruled that since pitchers Andy Messersmith and Dave McNally played for one season without a contract, they could become free agents. This decision essentially dismantled the reserve clause and opened the door to widespread free agency.